Aren't sure what pH is? 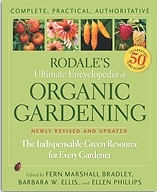 Then you might want to get Rodale's Encyclopedia of Organic Gardening. This is an in depth look at all aspects of gardening from composting and caring for the soil (the most important part of gardening) to choosing the proper plants for your area (the most fun part of gardening). An important work for all organic gardeners to have, whether they are just starting (especially if they are just starting) or have been at it a long time (there is always more to learn).